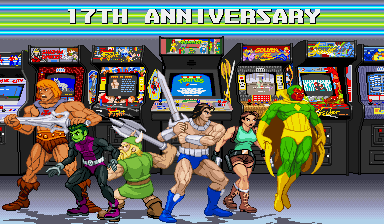 The 17th anniversary of this site just passed and 17 years of editing or making sprites lead up to some huge sprite galleries. Thing is, I really don’t feel like programming or making cornerbox graphics for every character and I’m not sure exactly how I’ll split everything into those galleries. 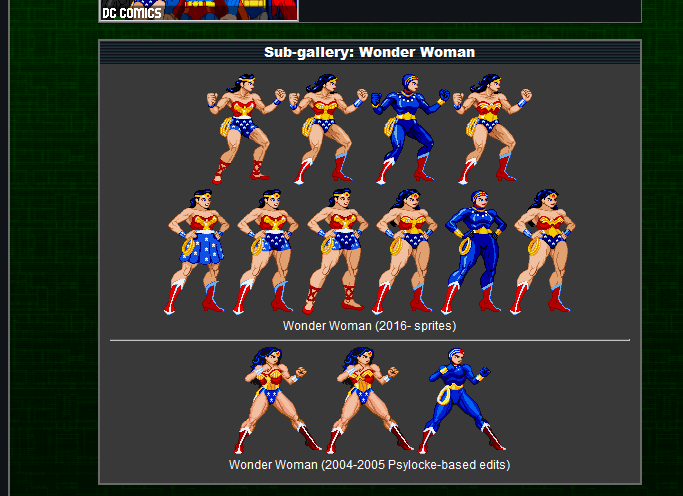 So, while re-coding the gallery script, I added a sub-gallery feature. 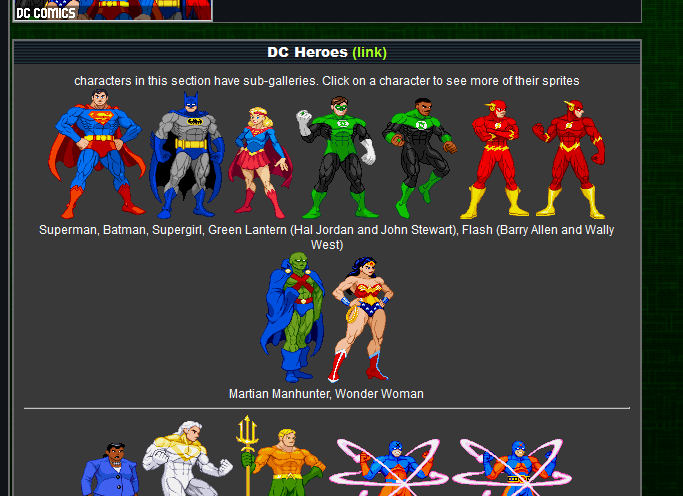 The galleries with sub-galleries usually have a section at the top with a single sprite or graphic of those characters. Right now, the only galleries using them are the Marvel and DC Comics galleries, mainly because they were the most bloated. They’re STILL bloated, because I’ve only done enough to test how much they work. More galleries will be divided in future updates. 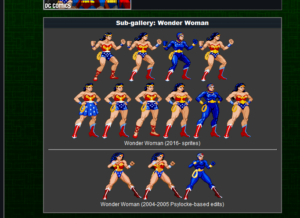 One side effects of the new gallery system is that there’s more room to post the extra sprites, animations and palettes that would’ve slowed down the old single pages or made them more clunky looking. 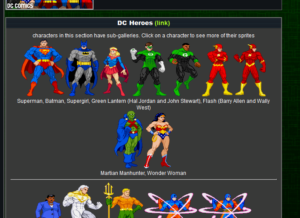 By the way, the DC and Marvel galleries have new corner box pics, so give ’em a glance while you’re on those pages, because you might find something that isn’t in the gallery. The Princess Peach picture is finally available in the ScrollBoss Shop! The last day of anniversary updates is only one thing: another video. The opposite of video posted on Wednesday, all the clips are my custom sprite work. You’ll see a lot of old clips, but a few have some additions (including one really sneaker, er, sneaky one). A few clips were rendered right before I rendered the final video. Again, you’ll see some sprites that aren’t in the galleries yet. As trying as this year has been for me, and I know I’m not alone out there (puts on Dusty Rhodes-like sunglasses), one of the things other than friends and family that kept me going through the rough spots is seeing people enjoy the site, the sprites, the prints and the posts I make elsewhere. I hope this weird place makes the load on your shoulders feel a bit lighter, even for a moment, in the same way that the games (and comics, cartoons, toys, movies, etc.) this site honors make me feel when I enjoy them. Thank you and I hope you’ve been enjoying the site! How do you follow up an update with a theme? Have an update with no theme at all! All of those sprites have been added to the GFX Generators, where you can make a graphics like the one at the top of this post. 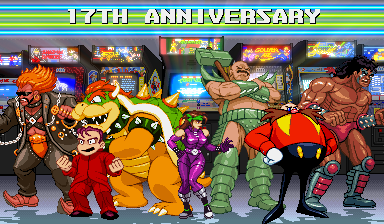 Also, the person who commissioned me to make some sprites that’d fit in with Konami’s TMNT arcade style gave me permission to add those sprites to the TMNT gallery. If you’re a fan of the 80s toyline and cartoon, I hope you’ll like those surprises. A small wrap-up update drops tomorrow! All that newness is also in the main GFX Generator, where you can make screenshots just like the one at the top of this post! It’s been a while since I uploaded a video, so I put another short clip compilation, but finally with the real ScrollBoss theme (for better or for worse, that’s up to you). Be ready for another update tomorrow! 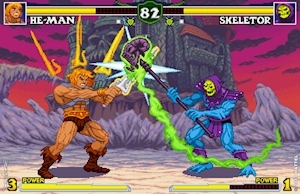 … the Masters of the Universe print I made for the Gallery1988 official Mattel art show! Curator (and creator of some of the cutest art you’ll ever see) Cuddly Rigor Mortis put a great show together, so be sure to browse that site’s gallery if you’re a fan of MotU (and She-Ra), Barbie, Street Sharks, Monster High and other Mattel joints. Even the classic electronic sports handhelds got some love! Unfortunately, my print was sold out (I couldn’t get a lot of prints made at the time of the deadline), but, thanks to the help of friend and talking with the curator, there’ll be news on that later on. I’ll be at the All Americon convention in Youngstown, Ohio, but only on Saturday, July 8th. All AmeriCon is a two-day event this year, but circumstances (and day-job work) means that I can only make it there on Saturday. Also, while I won’t have a lot of the 17 x 11 pixel art prints, I’ve got the 10 x 8 pics seen in this site’s shop and some small mini-prints you haven’t seen yet. I know of at least one seller of old video games will be there and other people in Artist’s Alley will have video game-themed stuff, so don’t feel that you’ve got to be a comic fan to have fun there! We’re 12 days away from the 17th anniversary of this site, but I’m going to warn you ahead of time that it won’t be as big as last year’s blow-out. I’ve been working almost non-stop on either commissions (most of it) or line art (just a bit) since February and I haven’t had a lot of extra time to work on the site. I still plan to make it worth your while to stop in on July 19th, so don’t forget to come back around that time to join in the fun!